BOSTON—Harvard Business School today announced the launch of HBX, a digital learning initiative aimed at broadening the School’s reach and deepening its impact. In HBX the School has created an innovative platform to support the delivery of distinctive online business-focused offerings, including HBX CORe, a primer on the fundamentals of business. The initial HBX offering, CORe (Credential of Readiness), comprises three interlinked courses: Business Analytics, Economics for Managers, and Financial Accounting. HBS Professor Bharat Anand, Faculty Chair of HBX, says that CORe will be a rigorous program designed for serious and committed learners. “The HBX faculty team has thought carefully about how to create an online offering that mirrors the energy you find in an HBS classroom and that allows students to benefit from the diversity and experiences of other students.” Consistent with the Harvard Business School case method of teaching and participant-centered learning, CORe requires students to be active learners, thinking through and solving real-world problems. Click here for HBX fact sheet. CORe will launch in June, initially with a limited cohort of students drawn from the greater Massachusetts region of colleges and universities; applications will be available in April on the HBX website (hbx.hbs.edu). A screenshot of the HBX CORe experience. In addition to CORe, later this year HBX will introduce a series of specialized courses for executives on topics such as entrepreneurship and innovation; disruptive innovation, growth, and strategy; and the microeconomics of competitiveness. Over time, HBX expects to roll out more courses that build on the HBS faculty’s influential research. Finally, HBX will introduce HBX Live, a virtual classroom that collapses geography and allows participants worldwide to interact directly with one another and a faculty member in the same way they would in a campus-based HBS class. Harvard Business School has partnered with the public broadcasting company WGBH to create a state-of-the-art space that will allow virtual engagement with up to 60 participants at a time. HBX Live will launch in Summer 2014 and be available initially on an invitation-only basis. Its early focus will include lifelong learning opportunities for HBS alumni and enhancing the School's modular Executive Education programs. HBX is the newest in a number of initiatives supporting Harvard University’s overarching efforts to infuse innovation into teaching and learning. In May 2012 Harvard and MIT announced the creation of edX, a non-profit online learning platform that would expand the reach of higher education by developing Internet-based courses that could be taken by students of any age, anywhere. 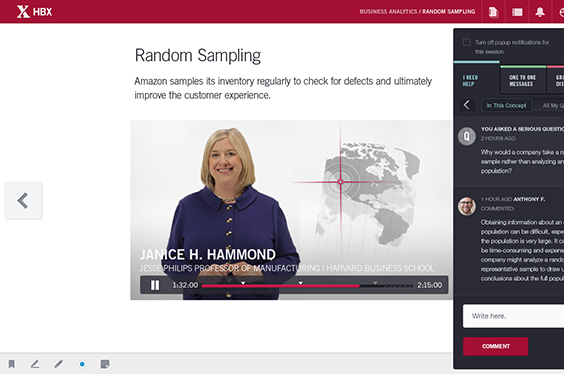 Today there are more than two dozen Harvard-based learning experiences on topics ranging from history to neurosciences to national security, all developed by HarvardX—a Harvard-wide initiative that enables faculty to build and create online learning experiences and conduct groundbreaking research in this rapidly evolving space. More information can be found on the HBX web site, hbx.hbs.edu.